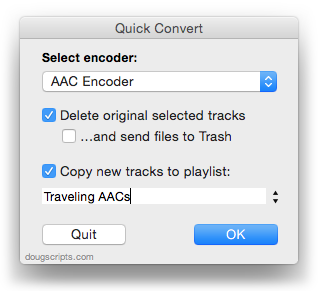 Doug's AppleScripts for iTunes » Bug or Feature? Sometimes it’s difficult to tell if a bug is really a bug or just a bizarre design decision. What I thought was a fixed bug might be the latter. The gist of this particular situation is that while you can select an individual Music track and change the Media Kind in its Show Info > Options panel to Music, Podcast, Audiobook or Voice Memo, you cannot select anything but Music on a batch selection. This post at Apple Discussions illustrates the issue with screenshots. It is frequently desirable to change the Media Kind of Music tracks to Audiobook because these kinds of files are often imported as Music tracks. But unless you want to change each one individually there’s only a complicated workaround that apparently requires deleting and re-adding. A Correspondent alerted me to the issue and he tested this script out on a few batches of tracks without a problem (thanks again, Stephen). To use the script: Open it in Script Editor by clicking the little script icon above. Save it named whatever you like with the Format “Script” (.scpt) in your ~/Library/iTunes/Scripts/ folder so that it will be listed in the iTunes Script menu. As usual with little scripts like this its often expedient to add a keyboard shortcut. Album Loved No Longer a Thing? 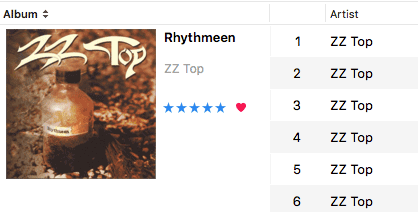 I was playing around with Album Loved settings in the latest iTunes (12.7.4) and I’d have sworn the Album Loved was displayed as a single heart adjacent to the Album Rating. But not now? You can see that “Loved” is chosen in the contextual menu but there is no indication that anything is loved. And it seems that in some Views, I can batch-set all the tracks to Loved, but not the actual album—or, at least, this is not being displayed. But I rarely use this configuration. So now I’m wondering if I am “mis-remembering” the Album Love heart in Album View? posted in Bug or Feature? 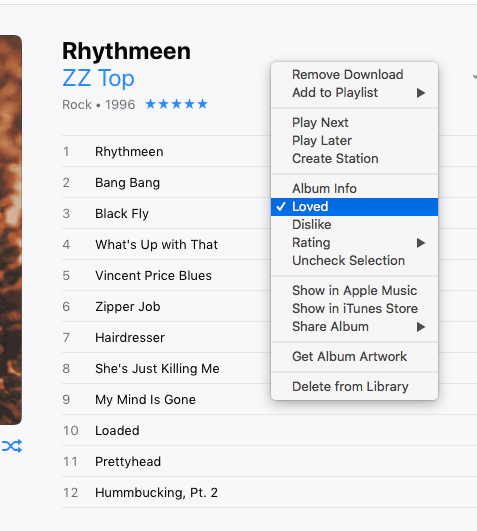 iTunes 12.7 introduced the “Downloaded” playlist that can be made accessible in the Library section of the Sidebar. Ostensibly, this playlist contains all the tracks you have downloaded in one way or another from the Apple Store, iCloud Music Library and Apple Music. Thus, any script that needs this information to work with the Downloaded playlist will fail. A couple of Correspondents have reported that fresh installations of Sierra do not have a “iTunes” folder in the User Library folder (~/Library/iTunes/). Traditionally, this folder contains the “iTunes Plug-Ins” folder and the “Scripts” folder (see my Download FAQ page for more details). Additionally, some third-party apps may use this folder for caching their own iTunes-related files. However, the “Scripts” folder is not created automatically and needs to be created by the user; and I believe Apple has lately inhibited the use of third-party visualizers such that the “iTunes Plug-Ins” folder may no longer be necessary. Perhaps, therefore, the ~/Library/iTunes/ folder is not created automatically anymore either. To repeat: this seems to affect clean installs of the latest Sierra and iTunes 12.6 and later. If you already have these folders configured on your machine they will not disappear when you upgrade the operating system—at least, that’s been my experience. iTunes still looks for AppleScript files in this location to make them available in its Script menu, so if your system isn’t configured with the ~/Library/iTunes/ folder you will have to create the intermediate “iTunes” folder there and then the “Scripts” folder within it. AppleScripts can also be installed in the /Library/iTunes/Scripts/ folder—that’s the [startup disk]/Library/ folder and putting AppleScripts here makes them available to all Users. Again, the “Scripts” folder may have to be created by the user. AppleScripts will appear in the system-wide Script menu in the Menu Bar when they are installed in ~/Library/Scripts/Applications/iTunes/ for the single User or /Library/Scripts/Applications/iTunes/ for all Users. Not too long ago, a version of the iTunes scripting definition used the new value “music” for the media kind property. Unfortunately, this caused confusion with the similar “Music” value for a playlist’s special kind property. This was eventually fixed such that “song” was used instead of “music” for the media kind property. All’s well now, right? We’ll never see a mistake like that again, right? 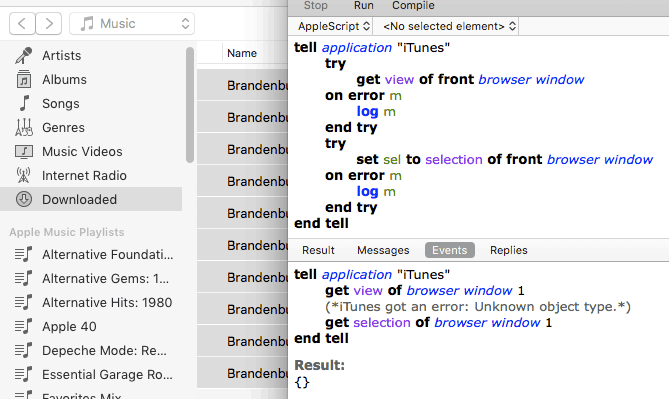 It happens that “songs” is an enumerator value for the search command as well as for the new shuffle mode property. And, unfortunately, when “songs” is used as the search command’s only value—eg: search somePlaylist for “my search text” only songs, indicating that one wants to search just song titles—some kind of ambiguity issue causes a reversion to the default all value. Thus, every tag is searched for the search term instead of only the song titles and you’ll get a lot more search results than expected. For example, in searching my Movies library for “Big”, I not only got “The Big Lebowski” and “The Big Chill”, but a bunch of other movies that had the word “big” in their description tag. Ironically, a search of the scripting definition file may have caught this before “songs” was re-purposed for shuffle mode. This affects at least one script of mine, Search Results to Playlist, which I’m fixing with a silly workaround using hard-coded enumerator codes in a run script handler. Yech. Kirk wrote about missing artist photos in iTunes for one of his Macworld columns recently. 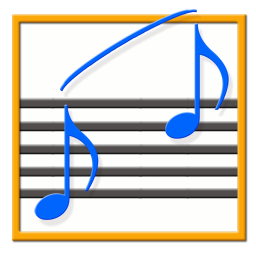 This is an effect that was introduced in iTunes 12.5 and the iOS 10 Music app. It is disappointing to have so many microphone logos and tiny artist photos in one’s library. Several correspondents have inquired about fixing this with some kind of homebrewed kludge, but I’m afraid not. Artist images are handled internally by Apple and the iTunes/Music apps. There is no “artist image tag” or hook or cache or anything like that such that images can be supplied by the user. So, watch out. This may be a display issue but I am not sure if Apple can fix it at their end or an update to iTunes is required. UPDATE ALSO (September 16, 2016): This issue appears to have been resolved today after re-entering Work and Movement text. Come to find out, iTunes 12.4.1 gets fussy about converted files when iCloud Music Library is active. As soon as the new converted file is created (again, via AppleScript) and added to the library, iTunes goes into its “Waiting…” mode—waiting to upload the file to the cloud. This apparently prevents AppleScript from doing anything with the new track entry. Strangely, all the properties for the new track are available. So, I tried adding it to the playlist using its location (file path); I tried persistent ID‘ing it from library playlist 1 to get a reference to it; neither worked. It wasn’t until I shut iCloud Music Library off in iTunes > Preferences… > General that a newly converted track entry could be copied to a playlist. After some more experimentation with iCloud Music Library turned back on, I tried setting up a loop that waited for the cloud status of the new track to change to uploaded. But, since it can take several minutes for this process to be initiated, I abandoned this. If iCloud Music Library is ON, the “Copy new tracks to playlist:” option is ineffective.